Safeway’s Feed the Need summer campaign is underway and you can help Placer Food Bank at the check stand of participation Safeway locations through the end of July. 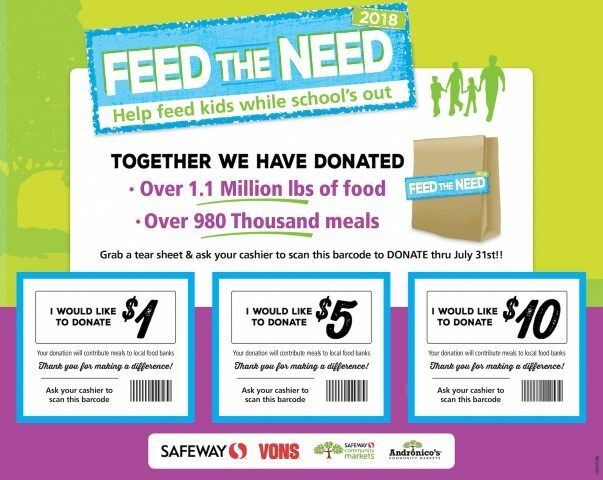 Safeway shoppers can easily donate to Placer Food Bank this summer during Safeway’s Feed the Need summer campaign. It’s happening now through July 31st and the following locations are collecting specifically for Placer Food Bank. All you need to do is grab a $1, $5 or $10 donation slip from the in-store display and the cashier will scan it at the register. That’s it – it’s that easy! Here are the location that will benefit the Placer Food Bank through July 31. We hope you will “Feed the Need” to help us fight hunger.